problems are based on real-life events surrounding the derby’s theme. Also known as the Indiana or Vincennes Trace, the “Old Buffalo Trace” was created by migrating American Bison or “buffalo,” moving from the salt licks in Kentucky to the prairie in Illinois. Millions of bison migrated annually between these areas, creating a route that varied from 12 to 20 feet in width. Even more amazing, in places the hooves of the migrating beasts pounded through solid rock to depths of as much as 12 feet! As people came into the area, they found the trace a good way to quickly travel. The bison tended to avoid swampy and marshy areas, so the trace often followed the ridges and gaps. Its numerous splits afforded the early peoples a variety of routes that could be taken depending on local conditions or the weather. An early surveyor found that utilizing the trail took half the time to travel versus using the waterways. In the 19th century, thousands of eager settlers migrated west using the trace. To protect travelers, rangers were stationed along the trail. By 1819, over 5,000 settlers were traveling on the trace. Towns and improvements to the road would slowly eliminate many traces of the trail. Eventually, many traces of the old trail vanished, along with the buffalo. No longer do the herds migrate the historic route. However, there are a few remnants that are being preserved. Today, the Old Buffalo Trace is recognized as one of our nearly lost historic pathways. 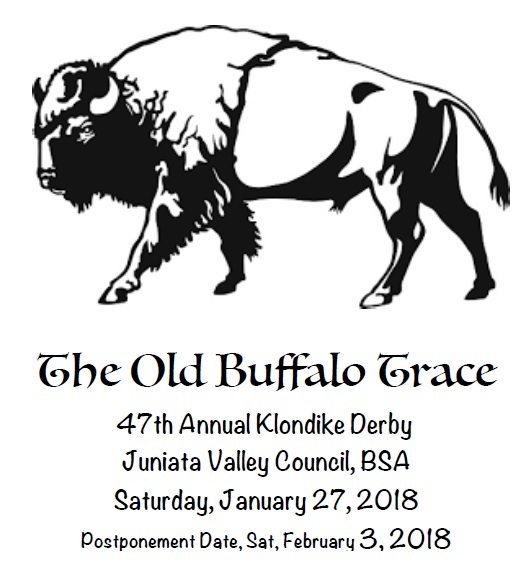 Come and relive the story of the Old Buffalo Trace at this year’s Klondike Derby.